The map to the right highlights the location of Mississippi in red. The State of Mississippi is bounded by Tennessee on the north, by the Gulf of Mexico on the south, and by Alabama on the east. It is bounded by Arkansas on the northwest, and by Louisiana on the southwest. Mississippi is the 31st largest state in the United States, and its land area is 46,907 square miles (121,489 square kilometers). Mississippi is divided into 82 counties. This Mississippi map site features road maps, topographical maps, and relief maps of Mississippi. The detailed, scrollable road map displays Mississippi counties, cities, and towns as well as Interstate, U.S., and Mississippi state highways. The pannable, scalable Mississippi street map can be zoomed in to show local streets and detailed imagery. to view a scalable Mississippi road map. The detailed Mississippi map and the regional Mississippi map display cities, roads, rivers, and lakes as well as terrain features. The detailed map shows only the State of Mississippi, while the regional map shows Mississippi and the surrounding region. Mississippi's capital city is Jackson. Other major cities found on the Mississippi map include Gulfport and Biloxi. In 2005, the population of Mississippi was estimated at 2,908,496, which is about 62.3 people per square mile. In 2010, Mississippi's population rose to 2,967,297 people. The state's primary Interstate Highways include I-10, I-20, I-55, and I-59. The name Mississippi is derived from a Native American word that means "great waters" or "father of waters". The state's topography slopes westward to the Mississippi River alluvial plain, from the hills in the northeast. The sandy soil of Southern Mississippi is mostly covered with pine forests. In August, 2005, this low-lying terrain was devastated by a Category 4 hurricane named Katrina. Mississippi's landmarks include the Natchez Trace Parkway, Vicksburg National Military Park, and Mississippi Petrified Forest. For Mississippi travel and tourism information, visit the official Mississippi tourism website and this Mississippi Atlas. This online Mississippi reference map shows major cities, roads, railroads, and physical features in Mississippi. 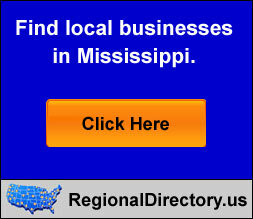 Several map publishing companies offer printed maps of Mississippi. For example, Omni Resources offers several maps of Mississippi that feature points of interest, airports, and parks, as well as selected local attractions and insets of major Mississippi cities. Mississippi-Map.org Editor, State Maps, PO Box 775, Barnegat, NJ 08005.